The Nature Centre (Yellow House) is located along Lighthouse Lane, just after the day use picnic area along the Lake Ontario shoreline. This building introduces visitors to the rich Biodiversity of the Park under the theme 'We're all connected'. 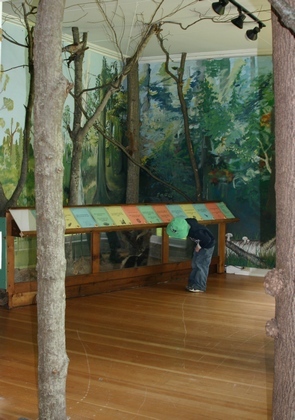 Each room presents a Park habitat [Marsh, Forest, Old Fields and Lake] and what lives there. We show how each specimen is connected to and needs the others - including us. And in the Biodiversity room we show what can go wrong if we, as humans, forget we live 'in' nature and don't care for it. We also see what is going right, in the Park, as we look after our campgrounds, trees and mammals. 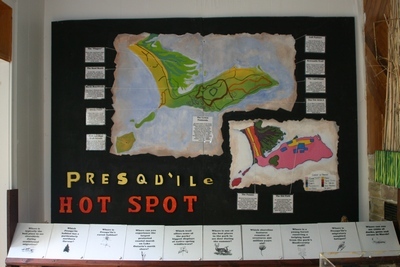 Most popular displays are the live examples of reptiles, frogs, fish and monarchs to help visitors understand the variety and beauty of life found at Presqu'ile. Our hands-on Ordovician fossil display, and diorama depicting life at Presqu'ile 450 million years ago, is also a big hit. We'll also show you where you can go in the Park to discover these creatures yourself. 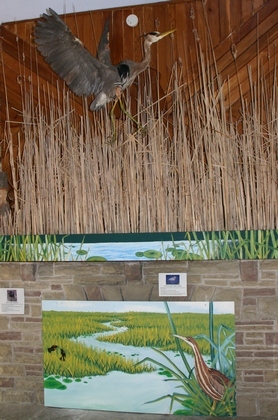 The Nature Centre also offers a learning centre: a library of field guides and other nature books, nature videos running continuously, and craft supplies for the young nature artiste. Opening hours: 10:00 am to 4:00 pm daily from the Canada Day Weekend until Labour Day Weekend. Both The Nature Centre and The Lighthouse Interpretive Centre are staffed by enthusiastic interpreters who are more than willing to discuss the many special features of Presqu'ile Park with you, and hear your stories about the Park. Linked to the Nature Centre experience are the daily events throughout the Park showing you our bio diversity via a Nature Interpreter.